I believe the coupon of choice this evening was offered from Bloomspot: spend $25 and receive $50. I had never heard of Euno, most likely b/c of its small sign and Salem Street location away from the hectic Hanover. When I checked out the website and saw Rachel Ray’s stamp of approval I figured it was a must try. 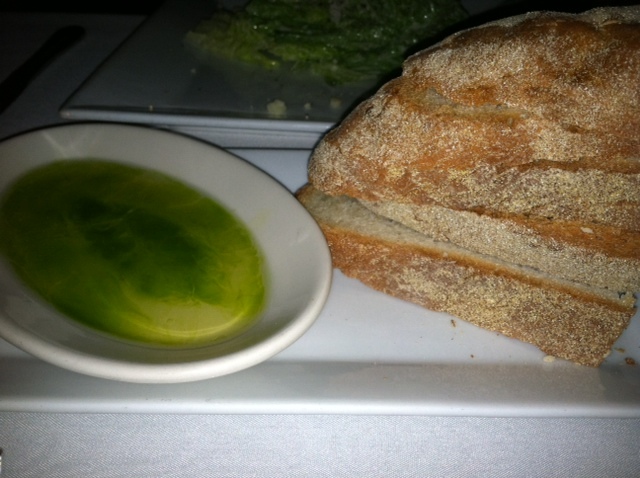 Bread: About 4 slices of white Italian was served with a side of infused EVOO. The bread was good but not anything special; a typical Italian loaf, not particularly warm or doughy, but soft with a good crust. Menu: Antipasti, Insalata, Pasta, Pesce, Carni, and the waiter had about 7 specials to add. There were a couple of fish specials with an amazing sounding risotto, which made my decision a littler harder, but I was in need of a great Bolognese so I took my chances with Euno’s version. Four slices of tomatoes alternated with 5 slices of mozzarella next to a side of arugula topped with a roasted red pepper. You usually don’t see the mozz out weighing the toms, and usually this would be a positive feature, but not when the cheese is hard and unappetizing. 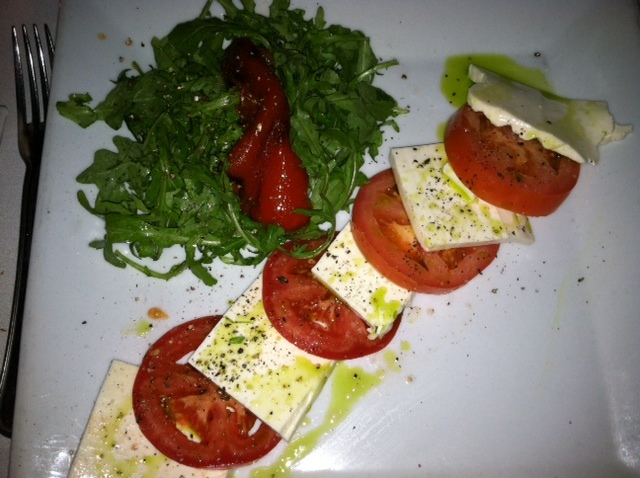 I would not recommend this dish as the mozzarella was uncharacteristic of any I’ve had in the past. The side salad however was nice & refreshing, lightly tossed with a simple dressing. The homemade pasta was served on a square dish and topped with a basil leaf. The meat was Osso Bucco style and shredded rather than ground, which I wasn’t sure about at first but ended up really loving it. The proportion of sauce to pasta was perfect, the portion wasn’t too overwhelming, and pasta was cooked al dente – no complaints here! Bathroom: Three unisex one-room bathrooms are located downstairs, where there were surprisingly more tables. 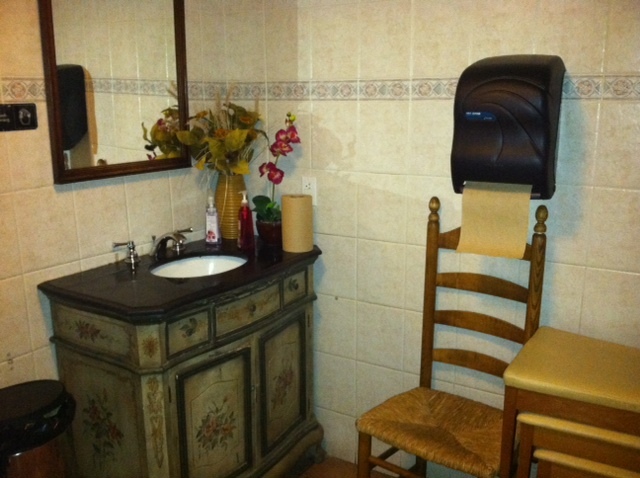 The restroom I used was clean, had a warm décor, and offered 2 different types of nice smelling soap! Service: The gentleman who greeted us at the door was extremely friendly and upbeat. Our waiter was prompt and recited all 7 specials from memory. The bread was a bit delayed b/c “they were slicing it”, which isn’t that big of a deal (it still arrived before the appetizers). We received each course rather quickly, which may make some people feel like they’re bring rushed, but it works for me & Matt! Overall: Prices do not appear on the website which typical means entrees run over $30; my pasta was the priciest option in that category at $21, and Matt’s swordfish special was $35. We both cleaned our plates but I’m convinced you can get a similar quality of food for less. 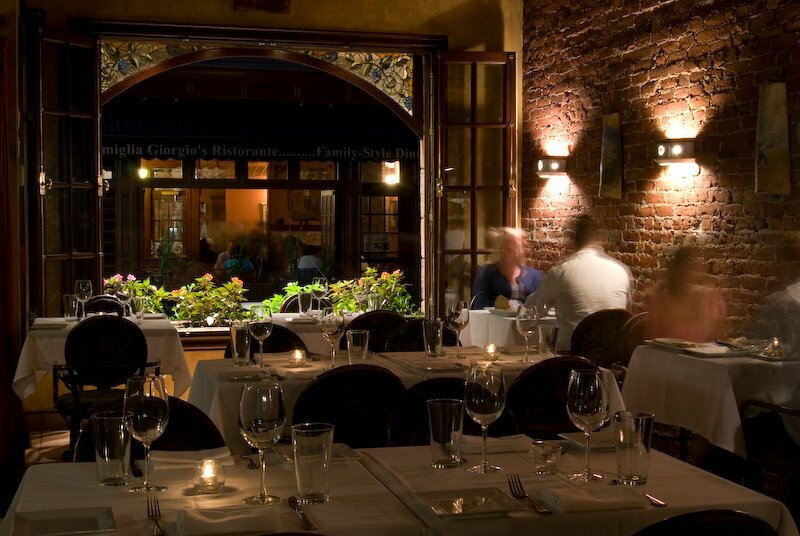 I did enjoy the charming atmosphere with exposed brick walls and dim romantic lighting. I grabbed this image from the website but this was my view for the evening, peering out onto Salem Street. Our meals were fantastic, and I wouldn’t tell you to not go to Euno, but I think you can experience the same for cheaper at other Italian eateries. 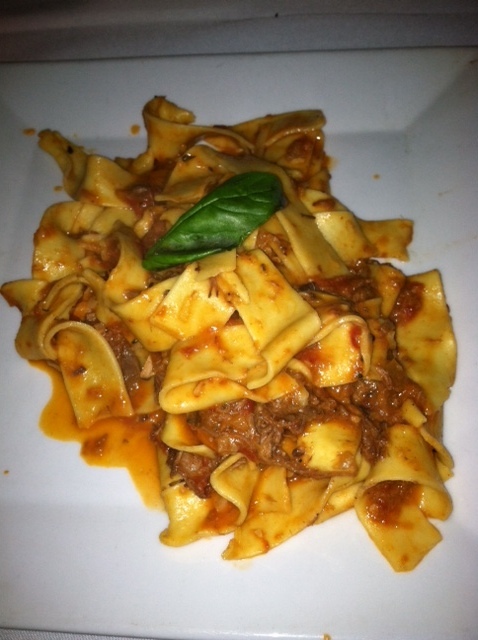 The Perfect Bite: Pappardelle Bolognese – perhaps in my Top 5 Boston Bolognese! If you’re curious, current favorites are from Stella (South End), Lucca (North End), Teatro (Theater District), and Mamma Maria (North End). Pingback: Ristorante Euno | Salat rezepte.